Ms. Bock has experience working as a bank teller and a retail associate, and grew up helping in the office of her family's business, Bock Marine. Ms. Bock is from Beaufort, North Carolina, and has lived in the Norfolk/Virginia Beach area since fall of 2014. She enjoys playing recreational soccer, going to the beach, boating, traveling, and playing with her Labrador retriever, Sadie. 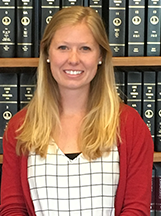 Ms. Bock graduated from the University of Mount Olive in North Carolina in 2014 with a Bachelor of Science degree in Mathematics. She was also a member of the Women's Soccer Team during her four years there.